When people hear all the dietary restrictions my kids have, the first question I get is, “What can they eat?”, followed by “What do you feed them?” It’s actually not all that different than what they were eating before, just without the gluten and dairy. 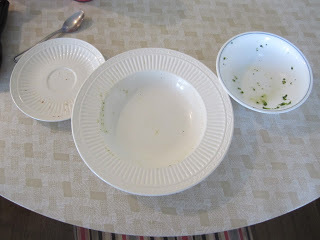 I decided to take pictures and document everything we eat for dinner for 30 days. I didn’t get pictures of everything, but most of it. With four kids all with different food sensitivities (and some just with different likes), I often cook more than one meal for dinner. I also have a daughter who is absolutely starving when she comes home from school at 3:30pm and a snack will not suffice. She has lunch at 11:15am and there is no snack at school (wish there was!). When she’s home, she typically eats at least every two hours. She’s a bottomless pit. But, I have to say, eating gluten and dairy free foods isn’t all that filling, and we’re not big on processed snack foods, so most of my kids end up eating more like four meals a day. My daughter will eat at 3:30pm and then by 6:00pm, she is hungry again. When my other kids eat varies. My two-year-old is often sleeping at 3:30pm so she will eat when she wakes up, sometimes around 5pm. My 12-year-old likes to eat closer to 5:00pm and my 6-year-old likes to eat right before bed! He always says he’s not hungry and then come night time, he’s starving. But, I of course do feed him before that, he just may not eat very much…unless it’s chocolate pancakes! My oldest two drink only water. My younger two drink watered down Simply Lemonade. I’ve attached links to any recipes. I also don’t like to cook on the weekends. I cook all week so by the weekend, I just don’t feel like cooking. We are both limited stage one and stage two Feingold and mostly GFCF, egg free, soy free, and peanut free. My oldest can do gluten and some dairy. If you are new to Feingold, please reference your shopping guide for approved products and stage one items. Mickey! 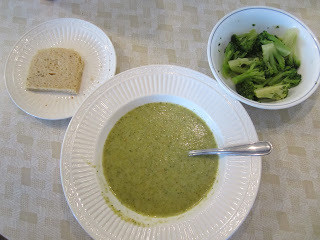 After school, my daughter had homemade broccoli soup, broccoli (I get a big bag of frozen organic from Costco) smothered in Earth Balance soy free butter, and she had two slices of Food for Life brown rice bread (we toast GF bread and cut the crust off). She dips the bread in her soup. Sometimes she adds Daiya cheddar cheese on top. My daughter loves veggies but my boys will only eat green beans and broccoli. My 6-year old had an Ian’s chicken patty. Didn’t get a picture but it looks like this. My two-year-old had homemade chicken nuggets,peas, and a smoothie made with coconut milk, blueberries, and raspberries. And I throw in some ground flax seed for omegas. Didn’t get a picture. I probably warmed some up from the freezer. My 12-year-old had a chicken breast meal with mashed potatoes from Boston Market. Not approved but he gets it every once in a while. He snacks on Back to Nature wheat thins, cheddar nibs, or Stacy’s pita chips every night before bed. 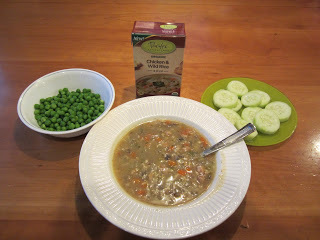 Later, my oldest daughter had Pacific chicken and rice soup and organic peas. Steak (grass fed from U.S. Wellness – www.grasslandbeef.com). This was filet mignon I believe. I cut them in half so they’re not as thick. So I get 4 thinner steaks that I split between 3 kids. 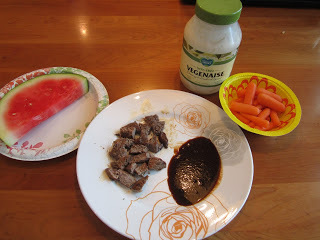 My daughter uses U.S. Wellness’ BBQ sauce to dip in. My younger son likes to use ketchup. Everyone had watermelon. I get the mini watermelons in the winter. 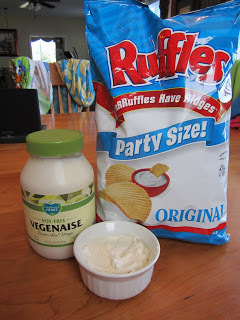 It’s hit or miss but most of the time, they’re OK. My daughter also had carrots and her new love, Vegenaise soy free mayo. I was going to look up a recipe and make some veggie dip or chip dip for her, but she loves it as is, so I haven’t bothered yet. My 2-year old can’t chew steak and I can’t eat steak either so I made a GFCF pizza for us. I freeze the leftovers and she eats it for lunch. I put garlic, onion, and green and red peppers on half of it. My older daughter ate this too as her second meal. She likes peppers. I make pizza sauce and freeze them in 1 cup portions for when I make pizza. This sauce is really good. 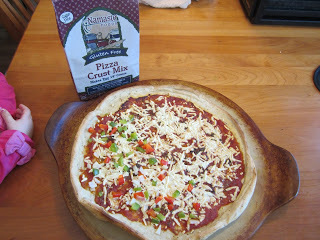 I order a six-pack of Namaste’s pizza crust mix on Amazon. I also made tacos later. My 6-year old loves tacos. I brought the leftovers to him for lunch the next day. I drop off his lunch at school about twice a week. He only likes meat and chips on his tacos. 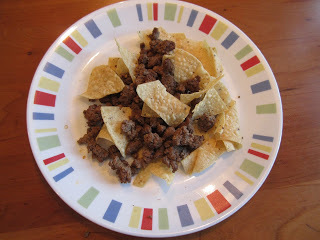 We use Xochitl corn chips. I get them from Woodman’s when they go on sale for 2 for $7 which is often. Otherwise, Whole Foods sells them for $4.99. Rip off. My older son eats them as a snack a lot. We buy all of our meat through U.S. Wellness. I keep a container with the taco seasoning mix in it, ready to use. 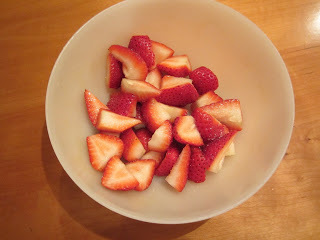 Later for a snack, my son had red grapes and my older daughter had more watermelon and organic cashews. 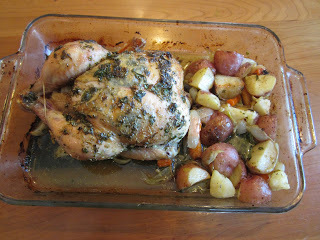 Rotisserie Chicken with carrots, onions, and red potatoes. I get an organic one from Woodman’s. We use Organic Smart Chicken brand for all of our chicken. Their rotisserie chickens aren’t that big but it feeds all of us. My oldest daughter had already snatched all the carrots and onions out of the pan before I could get a picture. She eats mostly just the vegetables with a little chicken. My 6-year old eats the legs (he calls them turkey legs because we get the big turkey legs at Disney World). 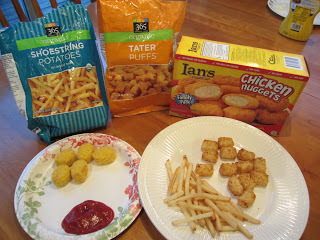 My 12-year old will eat just chicken, and my 2-year old eats mostly the potatoes and some chicken dipped in ketchup. With the remaining bones, I immediately start cooking chicken broth which I use for chicken soup. The broth cooks for 12 hours and is ready in the morning. 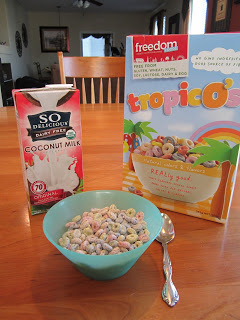 Later my daughter had a new cereal we just found. It’s stage two but she seems to be OK with it so far. It’s cheapest online on Amazon but you have to buy 5 boxes. Later some of the kids snacked on some Tings (like dairy free Cheetos), then I made some popcorn using organic kernels, coconut oil from Tropical Traditions (we use the organic expeller pressed. It has no coconut taste to it and is very high quality), Earth Balance soy free butter and sea salt. 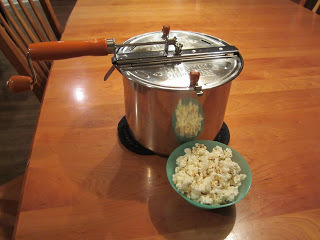 I got a crank style popcorn popper online. I think I got it from Overstock.com for around $40. It makes great popcorn! We use it a lot, especially for movies, where we bring our own popcorn. Before we were using a hot air popper from Wal-Mart. This one is way better. The hot air popper made the popcorn really chewy though my kids never complained. They loved watching it fly out. My daughter then snacked on some red pepper slices. 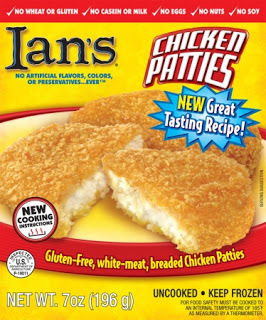 My 6-year old had an Ian’s chicken nugget meal. This is his favorite late night snack. My 2-year old often splits it with him. She likes the alphatots a lot and my son doesn’t. It was a beautiful day so we were outside most of the day. No chance to get inside to cook, nor did I want to. 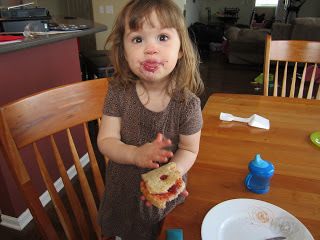 We ate a late lunch/midday snack of jelly sandwiches on gluten free bread. My grandma makes homemade strawberry jelly for us but we ran out. So, we used an organic brand from Woodman’s. 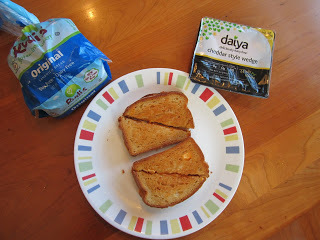 My daughters use Rudi’s Original gluten free bread. It has eggs which my son cannot tolerate so he used Food for Life brown rice bread. They don’t like it with peanut butter so we just use jelly. Nice and healthy I know. Pure sugar and carbs. My daughter also had a popsicle smoothie which I had made from the smoothie I had made her earlier in the week. 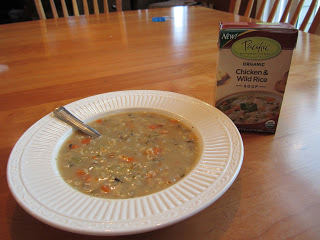 Later, my daughters had Pacific chicken and rice soup, cucumber, and organic peas. My 6-year old had an Applegate Farms beef hot dog with ketchup. For some reason, Meijer has these the cheapest and they go on sale every few months. Always keep these in the freezer or they go bad quickly. 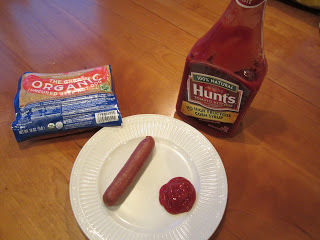 We use Hunt’s or Heinz ketchup with no added high fructose corn syrup. 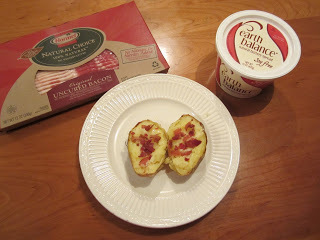 Then everyone had a baked potato with Earth balance soy free butter and bacon. 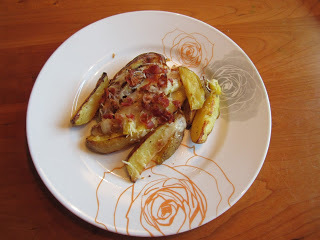 I keep extra bacon in the freezer for baked potatoes or BLT sandwiches. We usually use Hormel Natural Choice bacon or else we use Applegate Farms Sunday bacon but they are more expensive and you don’t get as much bacon. My oldest son was away at a sleepover. Planted our garden today after church then came in and made hamburgers. See recipe for hamburger seasoning above. I cook all our meat on the stove with a little olive oil. I haven’t used the grill in years due to health concerns. 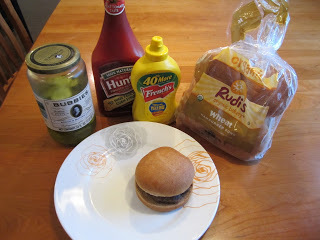 We use Rudi’s wheat buns. The whole wheat buns have “crumbs” on top which my son doesn’t like. These buns are hard to find so I freeze them. Whole Foods carries them but they often run out. We use Bubbie’s pickles from Whole Foods. I love these. Many regular pickles contain yellow dye. My grandma makes us homemade pickle spears that are really good. And here’s the gluten free version. We just ditch the buns. We’ve tried Ener-G tapioca buns and they’re OK but pretty dry and crumbly. 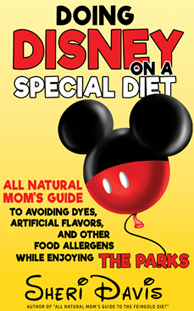 I think Disney uses these at some of their hotels when you ask for gluten free buns. Sometimes I’ve taken two slices of Food for Life brown rice bread and cut them out into big circles with a cookie cutter and passed them off as buns. 🙂 My daughter liked that for a while, and then she just started eating them without the bun. She likes hers with raw onion and Daiya cheddar cheese shreds. Later I also made 365 tator tots and shoestring fries and my two youngest had strawberries. I try not to give meat and potatoes at the same time as it halts all digestion. I usually make them at least an hour later.Then I made Ian’s GFCF chicken nuggets. My 2-year old didn’t eat her hamburger. Sometimes she will and sometimes she won’t. Was away all day at a doctor’s appointment, then a dentist appointment with one of my kids. 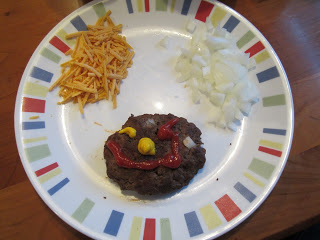 I had the babysitter make my daughter’s dinner when she got home from school. I picked up a hamburger from McDonald’s for my son. My babysitter made my daughter an Ian’s GFCF french bread pizza and warmed her up some leftover mostaccioli from lunch. We use Tinkyada GF noodles and usually I have homemade sauce in the freezer but she used a jar of Organicville Marinara sauce from Whole Foods. 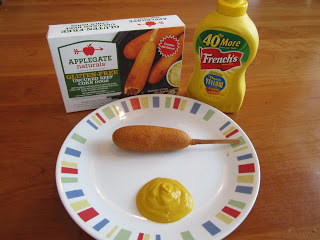 My 12-year old had an Applegate Farms corn dog and later had potato wedges with cheese and bacon. 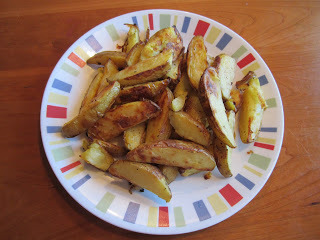 My other kids had the potato wedges without cheese or bacon. 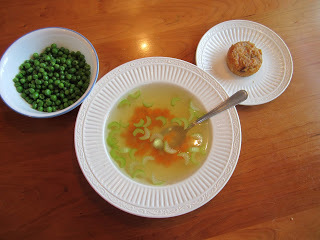 Later my daughter had homemade chicken soup, peas, and a carrot pineapple muffin with walnuts from the freezer. I have a recipe for chicken soup but usually I just take some frozen chicken broth and add a couple dashes each of sage, garlic powder, onion powder, and sea salt, and add in some carrots and celery. She never complains so I just go with that. Made some Frito chicken nuggets for my youngest two. My older two won’t eat chicken nuggets for some reason. I save the leftover chicken nuggets and freeze them. 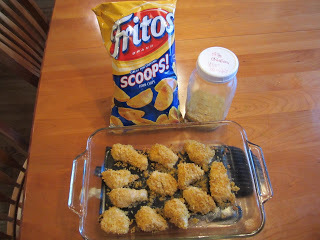 I keep a jar with the Frito crumbs and seasonings for when I make these. I love these. 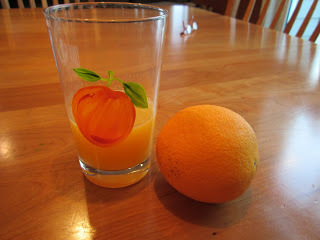 Made some fresh squeezed orange juice for my oldest. Needed to get some vitamins in him. Shhh…don’t tell him. Chicken Legs. My boys love chicken legs. My girls – not so much. The kids were outside on the water slide after school. It was 85 degrees in April in Chicago! My biggest challenge is cooking dinner in the summer when the kids want to be outside all day and I have to watch my younger two. Sometimes I can get my oldest to watch them but it’s usually a fat chance. 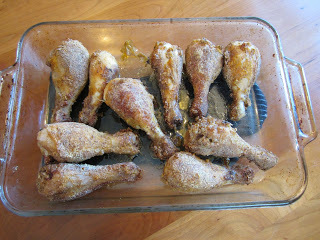 But, got these chicken legs done somehow. 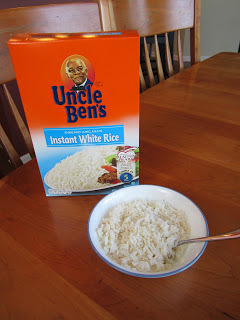 I made some Uncle Ben’s 5-Minute white rice for my oldest. He doesn’t like organic rice for some reason. Regular rice contains arsenic. Lundberg organic contains close to zero. I use that for the rest of us. 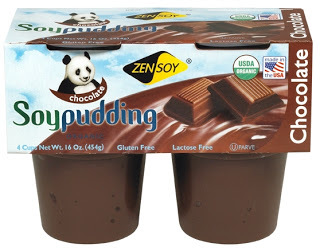 My younger son had some soy chocolate pudding. Couldn’t get a picture. These disappear fast. We don’t do these often because we usually avoid soy and they get very whiny and aggressive from these. But mom likes them. 🙂 They found my stash. 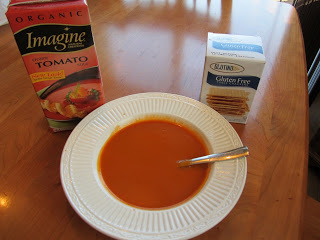 My two-year old had some Pacific tomato soup with some Glutino crackers. Not the best ingredients in the crackers (I think they have MSG and corn syrup) but the only decent gluten free crackers we can find. I need to make some some day. 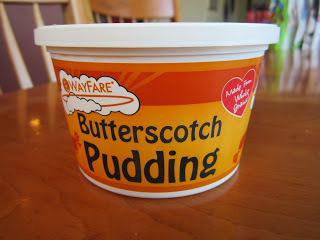 My older daughter had grilled cheese, potato chips and carrots and dip (her mayo), and a new GFCF butterscotch pudding we found. We really like it. It has a little bit of a grainy texture but when you’ve gone a few years without butterscotch pudding, who can complain? We heat it up. Ruffles are not truly gluten free. They have a lot of cross contamination if you are sensitive. I usually eat these only but my daughter decided to dip them in her mayo. Yuck. Later, my daughter had an Amy’s GFCF beans and rice burrito (I eat these a lot) and some watermelon. 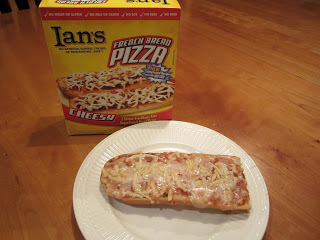 My two-year old had an Ian’s GFCF french bread pizza. And that concludes our week of dinners! Are you exhausted just reading it? I am! Yes, I cook a lot and I completely understand why they had servants in the Bible. Can I get one, please? Pretty please? Thankfully, we don’t have to go out and kill our own chickens. If you have fewer than four kids or have no kids with allergies, be grateful! Being able to do gluten and dairy opens up a lot more options for dinner but as you can see, I don’t think our dinners are all that strange. 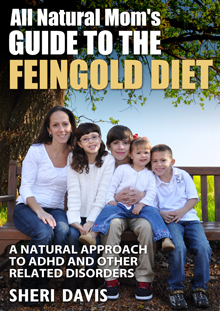 If you are new to Feingold, don’t feel overwhelmed. You don’t have to cook this much. I don’t mind cooking for my family though it is exhausting at times. And no we don’t usually eat together as a family. It’s my goal one of these days! It’s hard when they all eat at different times and different things. I did get a double oven recently though. Woo hoo! Hope this helps give you an idea of what you can eat for dinner when you avoid chemicals and are GFCF. Please post any of your family’s favorite dinners! Always looking for new recipes! Approach to ADHD” ” available now on Amazon! Hey Sheri sounds like so much work! I cook full meals everyday at least 29days a month! And I thought that wa hard work haha! I recently read Eat to Live by Dr Joel Fuhrman. And a great book about disease proof your child also by him. Have you read these? It seems that your family restrictions could really benefit from some of his ideas. Now I don't agree with all his stuff…. I'm a no soy no microwave kinda gal. Yes it is! I'd love a full time chef! Yes, I've read his books. I'm reading one right now. I'm also no/limited soy and limited microwave too. I like his ideas. 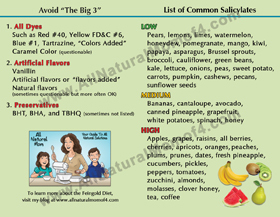 My kids just have some digestive issues and salycilate sensitivities which makes eating plant-based a little more challenging. But hoping to get there one day. We may try the GAPS or SCD diet soon. Hi Morgan! Sorry I forgot to get back to you! My DAN/holistic dr just moved or is in the process of moving to San Diego! He is awesome! He used to be a DAN but now is just holistic. He's always helped everyone, not just autistic kids. It's best to have them tested to see which supplements they need the most. He can help you with that. His name is Dr. John Hicks. His web site right now is http://www.elementalsliving.com. He is joining another practice out there. I have a couple posts on supplements and what we use and amounts. 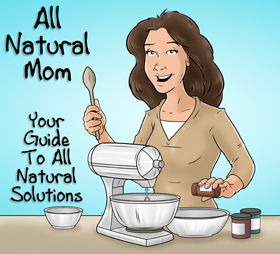 On the left side, click on "All About Supplements." I have one for ADHD specifically. I need to do a post on how to start CF and GFCF. http://www.tacanow.com has some good info on it. Good luck!